Every person encounters some form of sickness during the course of life. For a Muslim, Allah has made sickness a means of great rewards and blessings. It is also a swift and speedy medium of attaining a very special relationship and close bond with Him. However, many misunderstand the reality of sickness and thereby fall prey to depression and misery. 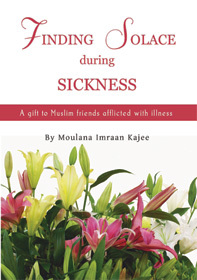 This booklet aims to explain the Islamic perspective of sickness, providing solace and encouragement to the sick and clarifying what man’s reaction ought to be when Allah tests him with sickness. This has been done in the light of the Qur’an, Hadith and incidents from the lives of the friends of Allah.